Written and starring Smallville's Michael Rosenbaum, this festival hit is a sometimes dark fantasy about a boy-giant. A child affected by a rare condition causing spurred development in physical size and strength. Brought to life by Rosenbaum and friends David Yarovesky (director) and Rob Danson (score), Ghild is a short with exceptional production values, where the careful consideration to all areas of filmmaking only acts in making the fantastical on-screen world somehow seem all the more believable. Just looking through the crew list on IMDB will give you some idea of the scope of this production and special praise has to go to those involved with the meticulous design of both the set and the costumes. Whilst at times Ghild may seem like just a highly entertaining opportunity for Rosenbaum to goof around and regress back to childhood, this is actually a film containing some notably strong performances from its younger cast members. With Jimmy Bennett and Jolie Vanier, as Brauly’s parents Jan and Ralph Gullivan, providing this shorts real moments of tenderness and reflection. However good Ghild’s child actors are though, the 2-minute cameo of comedian/actor Harland Williams as Ted Kalidakas, “the longest-living ghild out there”, steals the film. with his bizarre, yet heartfelt advice to Brauly providing Ghild’s best (and oddest) moments. Watching Ghild it’s hard not to instantly draw comparisons to the “man-child” films that have come before it. Fans of Jon Favreau’s Elf will certainly see echoes of Will Ferrell’s performance as Buddy in Michael Rosenbaum’s turn as Brauly Gullivan, the titular ghild. 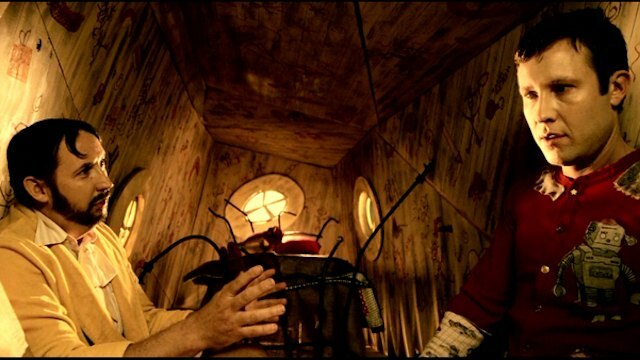 And whilst stylistically, you can’t help but be reminded of the works of Tim Burton in the off-kilter set-design and dark undertones, there’s enough substance and originality in Rosenbaum and Yarovesky’s short to suggest this is much more than just an imitation of its cinematic references. It’s charm and spirit should bring out the inner-ghild in even the most hardened of short film watchers.